There are still growth opportunities in this market for the enterprising investor willing to look. An enterprising investor is one who will go out of his way to find a stock that others might overlook because it doesn't fit in with conventions. It just so happens that such stocks can also be some of the best companies to own. We asked three top Motley Fool competitors to identify a stock they think would fit the bill and provide investors with good long-term returns. Read on to find out why EPAM Systems (NYSE:EPAM), Ulta Beauty (NASDAQ:ULTA), and Terex (NYSE:TEX) might be the growth stocks you never realized they were. Brian Feroldi (EPAM Systems): While it may not be a household name, EPAM Systems is a company that IT professionals from around the world are undoubtedly familiar with. EPAM is a leading provider of customized software solutions for businesses of all shapes and sizes. EPAM employs more than 22,400 designers, engineers, and consultants worldwide that can be quickly dispatched to create a unique software solution for a customer. Since many companies are in need of specialty software but lack the technological expertise to create it on their own, they can simply place a call to EPAM and quickly get their hands on the solution they need. What's wonderful about being an IT outsourcing provider is that most software needs to be constantly updated and maintained. This means EPAM isn't shown the door once it creates a working solution. Instead, the company's relationship with its customers tends to grow over time, which provides EPAM with a recurring book of business. In fact, EPAM's management team claims that nearly 90% of its revenue for the year is fully booked before the year even starts. With a strong base of recurring revenue in place, EPAM's management team gets to remain laser-focused on talent acquisition, winning new business and expanding profitability. A quick glance at the company's financial history shows that this business model is working out wonderfully for investors. EPAM Revenue (TTM) data by YCharts. 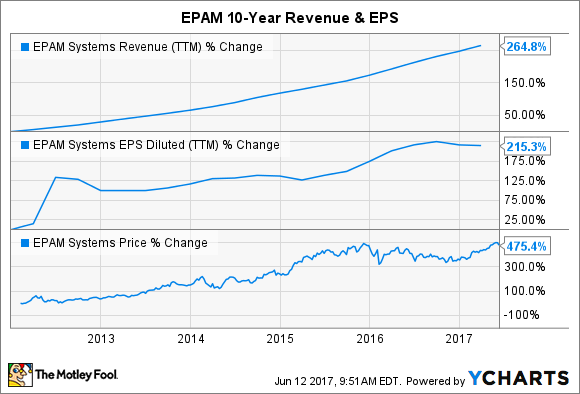 Looking ahead, Wall Street believes EPAM will continue to grow profits in excess of 17% annually over the next five years. With shares trading for less than 20 times next year's earnings, I think EPAM is a growth stock that even value investors can learn to love. Demitri Kalogeropoulos (Ulta Beauty): Ulta Beauty's business has shown no real impact from the industry slowdown that's pinching most retailers these days. Instead, the beauty and salon services specialist's latest earnings results describe a business that's in full-on growth mode. A healthy spike in customer traffic, along with higher average spending and soaring e-commerce revenue, sent comparable-store sales higher by 14% in the fiscal first quarter. The company outperformed on each of those targets, which led management to raise its full-year comps outlook to double-digit growth. The digital channel played the biggest role in that upgrade, as CEO Mary Dillon and her team now believe they'll post 50% higher e-commerce sales to mark just a tiny deceleration from last year's 56% spike. However, unlike many peers who have sacrificed profitability to capture market share online, Ulta Beauty's margins are improving: Net profit rose to 10% of sales last quarter from 9% a year ago. Ulta Beauty plans to add 100 new spa locations to its store footprint this year -- units that could come along at attractive terms given that many other retailers are closing shops in response to falling customer traffic. With 9% higher visits last quarter, and an 11% traffic increase in each of the prior two periods, Ulta shareholders can feel confident that the company isn't suffering from the same problem. These operating trends suggest the retailer could grow sales at close to 2016's 24% pace even as profitability improves toward management's long-term goal of hitting 15% operating margin by 2019. Rich Duprey (Terex): Mid-size construction equipment specialist Terex is mounting a comeback, focusing all of its efforts on a more focused, simplified structure centered around three segments: aerial work platforms, cranes, and materials processing. It has sold off virtually everything else that doesn't fit into these divisions, and though it is still posting losses on a GAAP basis, after adjusting for one-time restructuring-related charges, income from continuing operations was $5.5 million in the first quarter, or $0.05 per share, about even with last year's $5 million $0.05 per share performance. Terex is finding its footing just at the right time as it seems the industry is beginning to turn after a prolonged downturn. Caterpillar (NYSE:CAT) posted higher revenues and profits for the period that were ahead of analyst expectations. Deere (NYSE:DE) also beat on revenues and earnings. There are a number of risks that still face Terex, yet despite first-quarter business being slow in aerial work platforms and cranes, it was actually stronger than management had anticipated. Still, the important thing is that Terex has improved its financial position in such a way that will allow it to better deal with the vagaries of the business such as the replacement cycle that currently has hurt operations. Terex improved its capital structure by reducing its debt some $600 million while at the same time improving interest rates it paid while extending the maturities on the loans. When the market really does gain traction again, Terex will be well positioned to capitalize on it.